AdderRx Review (UPDATED 2019): Don't Buy Before You Read This! AdderRx is a supplement that is used to help supply the brain with energy to power through work, school or other daily tasks. 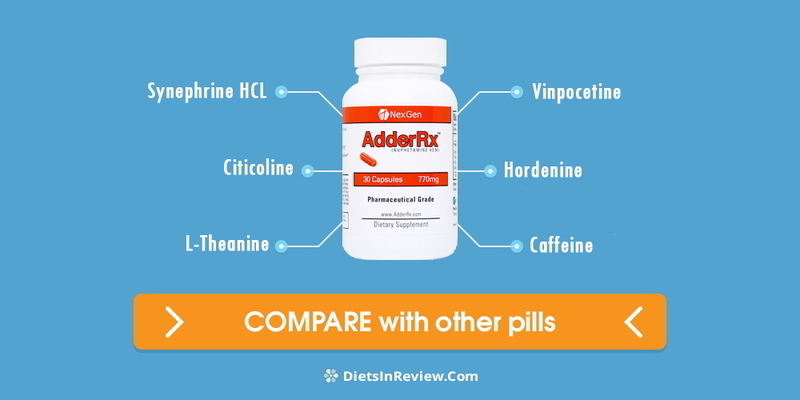 AdderRx is an alternative to caffeine or prescription drugs, improving concentration without the crash. AdderRx is made from a blend of ingredients that target the central nervous system, which in turn heightens concentration and focus. AdderRx also helps the body reduce natural stress levels, improving clarity and cognitive function. 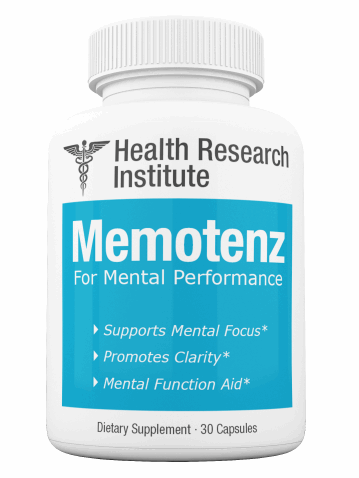 Our team of experts has found Memotenz is the most effective herbal memory supplement in today’s crowded market. Containing key ingredients like gingko biloba, St. John’s Wort and more, a daily pill provides greater clarity and function without producing any adverse effects. Click the link provided for an in-depth look at Memotenz. Synephrine HCL: A plant better known as bitter orange with properties quite similar to the ingredient epinephrine, synephrine is used to improve appetite, anemia, and relieve muscle or nerve pain. The NCAA has included this substance on their list of banned substances, as its often used to enhance bodybuilding or overall athletic ability. Side effects may include risk of high blood pressure, stroke, fainting or heart attack, and can be particularly hard on the heart when used in combination with caffeine. Citicoline: A brain chemical found naturally in the body, citicoline is used to help treat dementia, natural memory loss that occurs with aging, Parkinson’s disease, ADHD and brain injuries. This ingredient works by increasing the production of a brain chemical known as phosphatodylcholine, which helps repair damage caused by brain injury and is essential for carrying out normal brain function. In some cases, citicoline may cause headache, nausea, diarrhea and dizziness. Vinpocetine: A man-made chemical used to minimize brain damage in stroke patients, as well as improve blood flow to the brain, which in turn, enhances memory and prevents some of the symptoms of Alzheimer’s disease. Side effects may include dizziness, nervousness, nausea, insomnia and facial flushing. Hordenine: A plant molecule found alongside ingredients like synephine and tyramine, hordenine is a stimulant ingredient with little published research associated with it. It’s thought to provide a surge in energy—physical and mental, as well as stimulate the metabolism to enable fat loss with regular use. L-Theanine: An amino acid found in green tea, L-theanine promotes relaxation and focus and can help reduce stress and anxiety. Caffeine: A chemical found in a coffee, tea, colas and more, caffeine is used to stimulate energy and focus, treat headaches and improve symptoms of ADHD. Side effects may include insomnia, heart palpitations, nervousness, anxiety, jitters, nausea, vomiting, chest pain, agitation and more. DMAE Bitartrate: A chemical that occurs naturally in the body and helps nerve cells communicate with one another. This ingredient is thought to improve mood, increase energy and athleticism and boost memory and cognitive function. Schizandrol A: A plant used for many medicinal purposes, schizandrol A is used to increase energy, while reducing stress and improving physical performance during athletic activities. Side effects may include loss of appetite, upset stomach, rash, itching and heartburn. 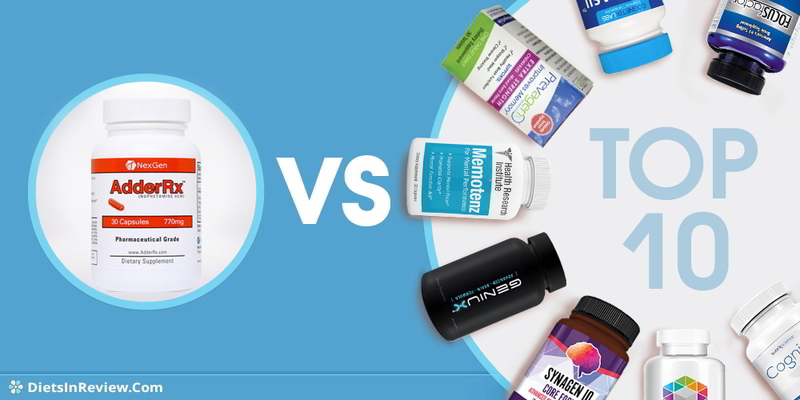 Click here for a look at our top picks for brain boosting supplements. In looking over the AdderRx formulation, this product appears to have some potential for those looking for improved brain function, as well as some additional mental and physical energy. However, this product does come along with some risks. For example, the ingredient synephrine could be dangerous in some users, especially those with existing heart conditions or high blood pressure. The NCAA has banned the use of this substance in college athletes, so competing athletes should avoid this product in case of disqualification. Additionally, using caffeine could increase chances of adverse reactions with use. Overall, it’s hard to know if this solution is safe and effective for most people. Strengthen your brain power – check out the brain supplements you should know about. AdderRx doesn’t appear to have an official website, making it somewhat difficult to find for sale online, though you’ll be able to locate the product if you dig around a bit. Groupon Goods is currently offering this product at a discounted rate of $26.99 for a two pack. Each bottle contains 30 capsules, so you’re looking at a two-month supply. 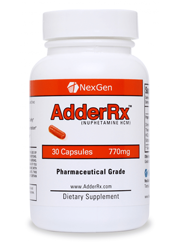 AdderRx is also available through the manufacturer’s website, negenbiolabs.com, with this product regularly selling for $39.99 for a bottle containing 30 capsules. The website offers a 100 percent money back guarantee, and offers a percentage discount based on the amount of products you buy from them. Everything you wanted to know about starting a nootropics regimen – click here for the insider scoop. AdderRx does not have an official product page, but NexGen has one umbrella site for all of their offerings, and presents the products for sale in a clear, easy to navigate format. For whatever reason, this website doesn’t not immediately come up when you search for where to buy AdderRx, which may make it difficult for some consumers to find it. The site offers consumers some information about AdderRx as well as their full lineup of products. Unfortunately, they don’t seem to provide much in terms of scientific evidence backing the claims put forth on the site, nor any of the side effects that customers may risk by trying this product. NexGen Biolabs has an A- rating with the Better Business Bureau, and by all accounts appears to be operating a legitimate, transparent business. According to a number of reviewer, AdderRx was pretty useful as an Adderall alternative, one person even claimed this was a good alternative to amphetamines, which may not be a great thing for most consumers. Some people added that AdderRx made them feel a bit off causing effects like dizziness, nausea, and nervousness, which is common in products with a stimulant effect. Based on the above information, it’s clear this product produces a wide range of results, but it could be useful for some people not worried about the side effects. Harness the power of your brain – our top picks for memory retention, mental edge and everything in between. Conclusion – Does AdderRx Work? After evaluating AdderRx it seems that it may produce some good results for a number of users, but people considering this product should be aware of the risks involved with taking this product or something similar. As the name suggests, AdderRx is meant to function as an over the counter Adderall substitute, which means it may produce similar results, but has not been regulated like the actual drug has. For this reason, consumers should be aware of potential for negative reactions. Some users felt jittery, dizzy or nervous after use, and the ingredient synephrine may cause some heart issues. There aren’t many major problems documented concerning NexGen Biologics, nor AdderRx itself, but the website doesn’t mention any side effects or things people should be aware of before they try this. 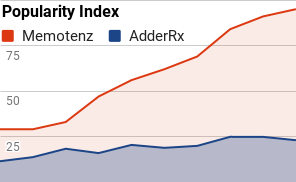 While AdderRx may not cause any adverse effects in most users, we’d still recommend looking elsewhere for something known to be completely safe, or that has documented quality control measures put into place. Should you still want to give this a try, talk to your doctor before adding anything new into your daily routine. Our reviewers have looked at several nootropics, herbs and more before learning Memotenz is the best option for people looking to safely improve their memory and cognition without any adverse effects. Memotez is made under current GMP guidelines, and is the subject of ongoing quality assurance checks, making sure consumers get a great product. Click the link here to learn more about how Memotenz can transform your mental capacity. AdderRX is a total scam. The only thing I notice is a jittery heart clenching stimulant rush that takes hours to wear off. There is no focus or clarity, perhaps because you’re too distracted by the side effects. There is a cheaper way to get this nasty feeling, just drink way too much coffee. Would help with weight loss because it causes a big lump in your throat and a knot in your stomach. Terrible product, don’t waste your money. You can get the same effects from drinking a couple cups of coffee or a few energy drinks. It has horrible side effects! Even worse than regular adderall itself. Normal adderall is a pure drug of only like 1 or 2 chemicals while AdderRx is a combo of 10 or more and can be dangerous if you don’t know how these will effect you! You’ve been warned.